View your Credit Report today and get expert assistance from our UK based team of Professional Credit Analysts. Most people check their Credit Report just to see what's on it. There's often more detail than expected. If you've been turned down for credit unexpectedly, you'll probably find out why. You're seeing what lenders see because we use the same system as they use to get your Credit Report. We will help sort out any errors for you directly with the agency whenever we can, to save time and trouble. Credit report errors are rare, but are really annoying and can have a big impact on your ability to get credit. About one in four of our customers contact us about issues on their Credit Report. Contact us in a way that suits you - we're definitely not hard to get hold of and we don't hide behind automated systems. Call us Freephone on 0800 086 9315 - no queuing or pressing buttons, you’ll be put straight through to one of our experts. Send a Secure Message – we'll always get back to you as soon as we can. Your query will be answered by a graduate credit professional based in the UK. All of our frontline staff study with the Chartered Institute of Credit Management – so you can be confident you’re getting good advice from someone as knowledgeable as they are experienced. The higher the score, the less chance of default, so people with high Credit Scores get better choice and cheaper credit. There’s no universal scorecard – you can’t compare Credit Scores from different sources. Our scores run the full range of 0-1000, bad to good, the current average is 700. Your Credit Score is a good overall measure of your credit standing. We can show you how to use your Credit Score to get cheaper credit. Our Credit Score is calculated on the full contents of your Credit Report, including your 6 year credit history. It's a measure of how you look when you apply for a credit card, loan or mortgage – based on the same data that lenders see. Yes, you may be linked with others on your Credit Report - rightly or wrongly. When lenders check you out, they take into account the credit history of those linked with you. They can improve your chances of getting credit, or wreck them. We can help you to get rid of those who shouldn't be there. If you don’t understand any part of your report or just need help, call us free on 0800 086 9315 , Monday to Friday, 8-6, or at weekends 10-4. Or send us a Secure Message or an email. Our UK based credit professionals are ready to help with any query, big or small. What else is recorded about you? 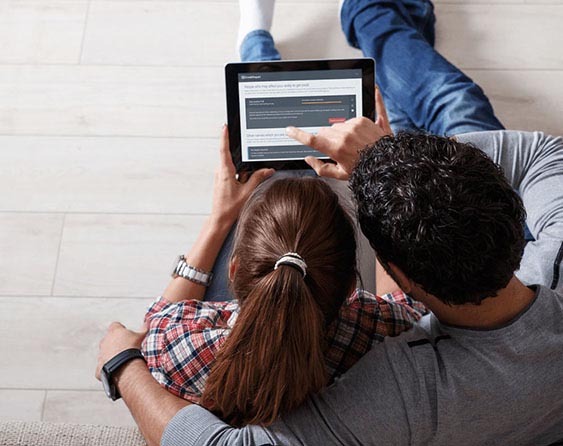 See how your overall borrowing levels have changed and how your Credit Score has varied. 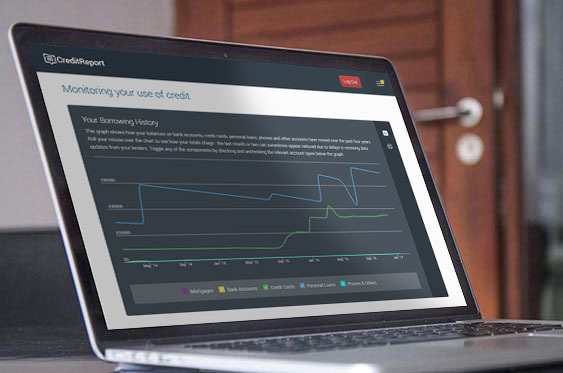 Check the balances and credit limits of each credit product for every single month over the past 4 years. See what addresses are linked to you, make sure you are listed correctly on the Electoral Roll and much more. This is a subscription service, but you can dip in and out whenever you want. There’s no pressure to stay, we won't try to 'save' your subscription or continually email you to try to get you back. Many of our customers find it surprisingly easy to cancel and to restart, so they subscribe only when they need to. Excellent. I found Credit Report to be very easy to understand and use. Unlike some other companies they offered a 30 day free period which was also easy to cancel. It is good to see some honesty. I would recommend them to anyone. Great credit report provider with a free months period. Report is very clear and structured so it is easy to find all the neccessary information which is also detailed at the same time. Left a little feedback on the website and received a personalised thank you email which also suggests a great customer service. Definitely recommended. I tried the free trial and was very impressed, It's easy to navigate and easy to read, and it is the only credit report site I will consider paying for when I'm in a better financial situation. Fantastic. Very good customer service. No wait. Quick accurate reports and staff are helpful on the phone. I recommend unreservedly. Highly recommend this service after using the free trial. Quick and easy to use, clear user interface and a great user experience. Everything is laid out perfectly and it's so easy to read, because everything you need to find out in regards to your credit has its own section that you can seek out with ease. It's amazing to see how much detail can be added to such a simple, clean looking report. If you plan on checking your credit score regularly (while also wanting advice on how you can improve it and see potential reasons for your given score), this service is definitely worth the price. Not to mention great customer service. 10/10. I found the website very easy to use, I liked the visual aspect of it and it was very easy to understand. I did leave a little feedback on their website and had a personal email come back to thank me - that doesn't happen often at all these days and I thought that was excellent customer service. I would like to add that some people have reviewed and complained about 'not knowingly signing up to a monthly direct debit' - it is pretty clear from the outset that you get a free trial period of which this then becomes £12.99 per month, but you can cancel at any time including during your trial period, which is exactly what I did and I have had no problems. This is people not paying attention and then blaming everyone else but themselves for not noticing. Please don't take notice of these reviews, as I found this site a lot better than the mainstream ones such as experian etc. What's the difference between you and other Credit Report providers? Our focus is firmly on providing consumers with a high quality service which enables them to access their Credit Report online, supported by best-in-class customer service from highly trained credit professionals based in the UK. Providing free access to our service for the first 30 days enables us to show our customers how we are different, and why it's worth paying for access to your Credit Report if you don't cancel within that free period. We make our money from customers who value the service we provide on its merits and are happy to pay a competitive monthly fee. We do not need to try to sell you credit products or other services to make money, so we don't litter your Credit Report with credit offers or spam you with credit products you probably don't need. On top of this, we give a cast-iron guarantee that we will never sell your personal data to anyone, which very few of our competitors can give. How do I know that the service is secure and how do you protect my data? 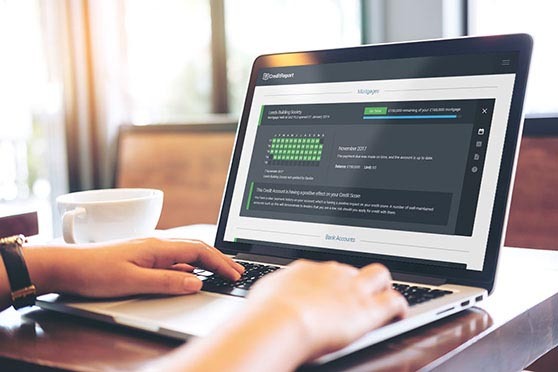 As the first company in the UK to enable consumers to check their Credit Report online, we have lived and breathed security for the last 20 years. Our services are subject to routine security testing and auditing by our suppliers and tested to ensure that there are no vulnerabilities by security professionals regularly. When you use our website, all information is encrypted using an SSL certificate from one of the most trusted security brands in the world, Norton. To access your account you require multiple pieces of information including a strong password. Before we show you your Credit Report, we undertake many checks to validate you are who you say you are, including data from your Credit Report itself amongst other sources. Which Credit Reference Agency do you obtain my Credit Report from? We currently base your Credit Report on data from Equifax. Is your Credit Score the same as those on other Credit Score websites? There is no single Credit Score in the UK. Lenders use Credit Scorecards that have been developed on a large sample of their own customers and which use data from application forms alongside data from your Credit Report to calculate Credit Scores that work well only for that lender. Credit Reference Agencies use Credit Scorecards that are based on part or all of the data from your Credit Report. None of these can be easily compared, but they all do the same thing, which is to provide a measure of how likely you are to default on a credit product. 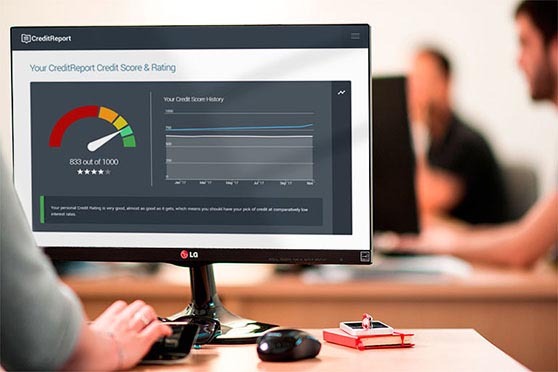 CreditReport Credit Scores are derived from the first Credit Scorecard to have been developed specifically to help consumers to understand how Credit Scoring works. They also measure how likely you are to default on a credit product. They can also be compared directly with the Credit Scores provided by checkmyfile and by givemecredit. You are ultimately much more than a number, more than a score. 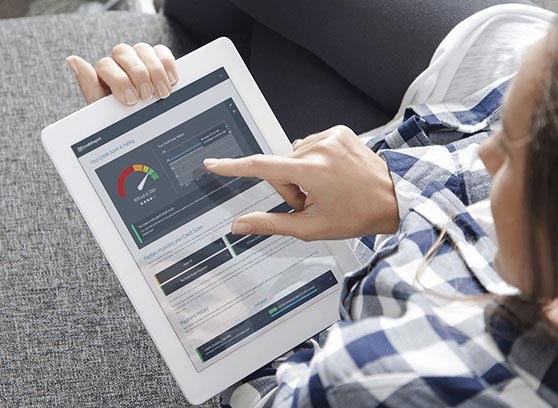 Credit Scores were produced originally to help lenders to distil the contents of a Credit Report into an easy-to-handle number, to save them from having to read what is often a complex and lengthy Credit Report. This is why it is so important for you to look deeper at the data on your Credit Report and not rely on any Credit Score too heavily. You can’t check a Credit Score for accuracy, but you can check the detail of your Credit Report. If I find errors can you fix them and can you help to remove any information that's harming my Credit Score? If you find any errors on your report, simply send our team of UK based professionally qualified Credit Analysts a Secure Message and they will investigate and help you resolve the problem with the lender concerned, or with the Credit Reference Agency. If the issue can be resolved by the Credit Reference Agency, we will manage the process on your behalf and keep you updated on progress. The removal of negative information is not possible if it has been recorded correctly - for example if you miss a payment or two on an account, there is no way to change history - this helps keep the cost of credit down for everyone as otherwise lenders could not make informed decisions on risk and therefore would have to assume the worst. The impact of negative information reduces as your Credit Report ages so long as positive information is being reported - our team will help you maximise your score through important housekeeping changes like ensuring your Electoral Roll status and financial associates are correct - these factors can harm your rating and are easy to resolve with the help of our team of UK based professionally qualified Credit Analysts. What if I find the service isn't for me - how do I cancel and can I cancel in the free 30 day period? Unlike many of our competitors, we do our best to make it as easy to leave our service as it is to sign up to try it. You can cancel at any time, including during any free period. Cancellation can be done by calling us free on 0800 086 9315 , Monday to Friday, 8-6, or at weekends 10-4, or by email, or online by sending us a Secure Message once logged in. In a few cases, we may require that you contact us to cancel by phone or email. Rest assured, no attempt will ever be made to dissuade you from cancelling. It's a quick and easy process and we'll always give you a unique reference number to confirm it's been done, for your own peace of mind. We pride ourselves on providing the best possible service to our customers so if we fall short we'd love to hear what we could do differently. Similarly, we won't revoke access to your account when you cancel, and will make it a seamless experience for you to come back in the future should you wish to. My question isn't shown, how do I get in touch? You can contact our team of UK based professionally qualified Credit Analysts Monday to Friday from 8am to 6pm and on weekends between 10am and 4pm. We’re closed on public holidays and are open from 10am to 4pm in the period between Christmas and New Year. If you’re an existing customer, the best way to get in touch is by Secure Message through the logged in part of your account. Alternatively you can email us at help@creditreport.co.uk or call us on our Freephone number 0800 086 9315 .